The icon herself, Clarissa Darling of Clarissa Explains It All, makes a fun, quirky and very recognizable costume, with tons of room for customization. A 90s classic, Clarissa's style is all about over-the-top pattern mixing, bright colors, headbands, shorts layered under other shorts, 60s flowers, 90s pop art, polka dots, globe-shaped earrings...all the good stuff! 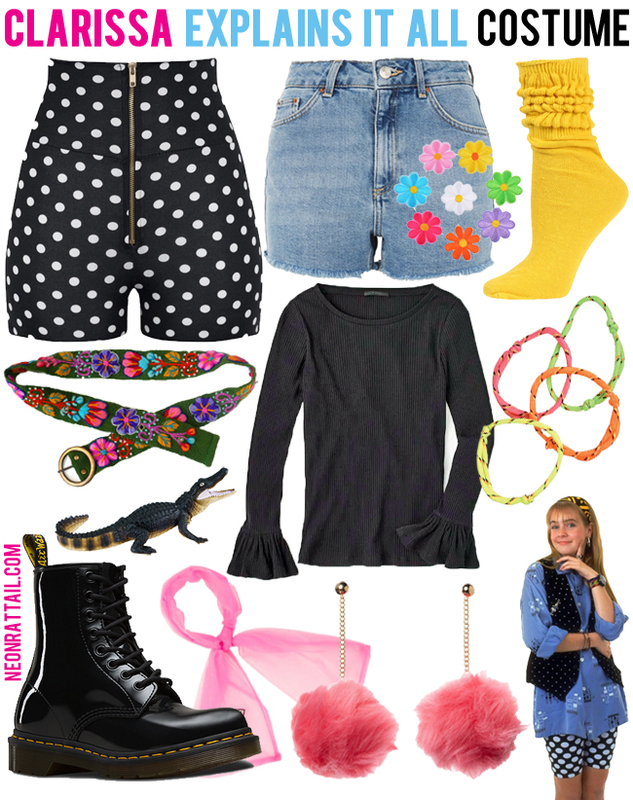 Dressing as Clarissa seems like a blast because you can basically wear any fun, bright clothes you want. Some black elements, like a moto jacket and combat boots, ground the look and make it distinctly Clarissa rather than just generically 90s. Just to be sure, why not carry a toy alligator as a reference to her pet Elvis? Live my childhood dream of having a piece of Clarissa's wardrobe! This is great to pair with maybe a Ferguson or Sam costume (carry a tiny ladder?!) for groups/couples, but honestly who needs anyone else when you look this cool?